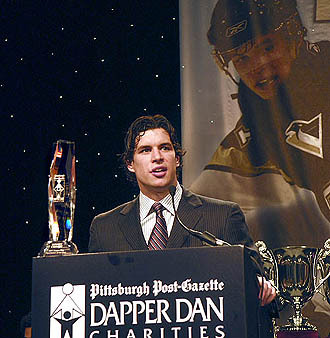 --Sidney Crosby and Agnus Berenato were the big winners at the Dapper Dan awards. Where does he put all these trophies? --Mike Tomlin has a staff member check eBay to see if any old Steelers playbooks are on sale. Does he mean like from the Chuck Noll era, or more of a Cowher vintage? Who knew he was a collector? 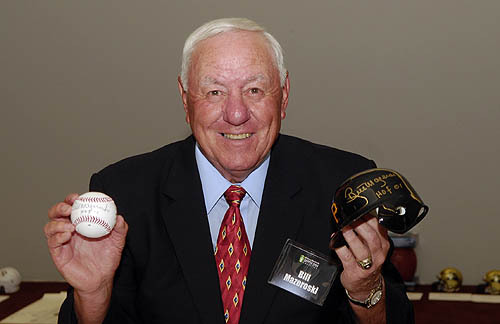 --Bill Mazeroski's home run was picked as the greatest moment in Pittsburgh sports history. Take that, Franco. 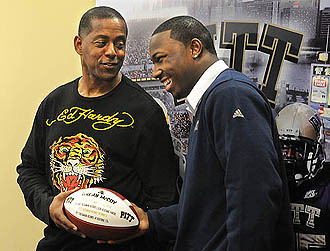 --Former Pitt star Tony Dorsett says LeSean McCoy is the first Panthers running back that reminds him of himself. Which means LeSean can look forward to a career of fame and riches in Dallas, Texas. --Barack Obama promises to bring hoops to the White House. But I doubt he's planning on doing much bowling should he win the job. --Jay-Z and Beyonce are getting married. What kind of wedding gift do you buy for the rap impresario who has it all? --A group of third-graders planned to attack their teacher, bringing a broken steak knife, handcuffs, duct tape and other items for the job. Is this one of those schools that needs yesterday's "rock star" superintendent? --National City bank confirms it's for sale, and hints that a deal is near. Yep, it's a great time to be in finance. --Pitt and Duquesne are disappointed with U.S. News and World Report's law school rankings. Let's just say they're not as high as Pitt's RPI rankings. 10 "Greatest" Celebrity Renditions Of "Take Me Out To The Ballgame"
So, McCoy is going to start wearing sweatshirts with tigers on them too? BTW, when I looked at the list of overexposed celebrities, it dawned on me how stupid we're becoming. Out of all of those people, only TWO of them were famous for SUCCESSFULL acting or musical careers: Tom Cruise and Michael Jackson. The rest are a bunch of reality TV stars and people who are famous for no apparent reason. So now, our tabloids (as if they weren't stupid enough) apparently are not only writing ridiculous stories about famous people, but they are also CREATING famous people.